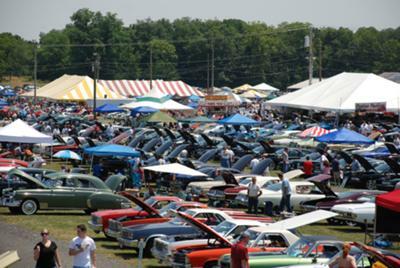 The Carlisle All-GM Nationals, one of the largest and most exciting All-GM events in the world, will once again showcase all vehicles produced by General Motors, on the 102-acre Carlisle PA Fairgrounds, the weekend of June 25-27, 2010. The National Parts Depot Showfield will be filled with top quality restored classics, original muscle cars and modified high performance new models - organized by year, make and model. A favorite event of all of The General’s men, the All-GM Nationals will also feature indoor displays of concepts, customs, performance and historically significant vehicles; test drives from Chevrolet; drag racing on Friday night for all skill levels; burnout competition; club gatherings and giveaway drawings for a vehicle and engine. The excitement continues with a shopping experience that is second to none, including a huge swap meet with a wide variety of vendors, an All-GM car corral and the Manufacturers Midway – featuring top names in restoration, aftermarket, custom and performance manufacturers. All roads lead to Carlisle, Pennsylvania for the All-GM Nationals, where you’ll find a community of passionate automotive enthusiasts and a commitment to excellence of service that can only be achieved with over three decades of automotive event experience. Carlisle All-GM Nationals – June 25-27, 2010. Here's another car show I'd love to attend. My all time favorite car has been the 57 Chevy. That was the car I learned to drive in (now I'm showing my age). I have no doubt you'll have some on display in your classic section. I'd also love to see the new electric Chevy we're hearing so much about.